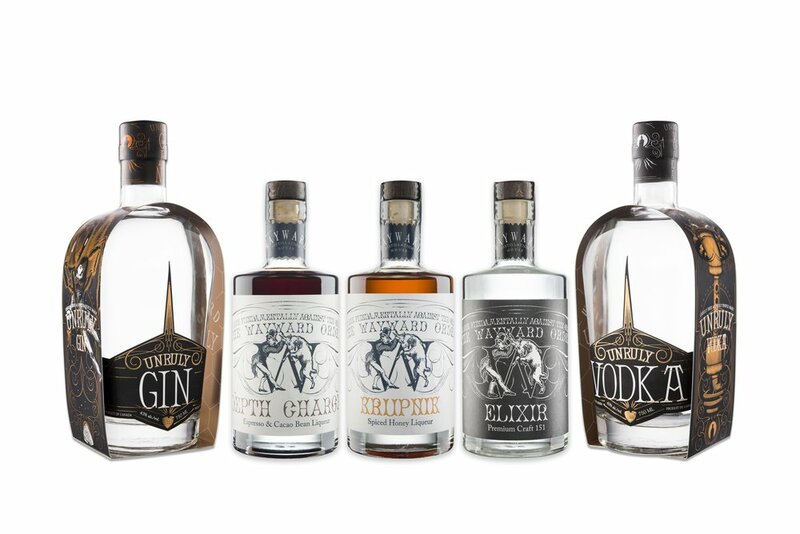 Wayward Spirits: Unruly Vodka, Unruly Gin and The Wayward Order. WE STILL HAVE A FEW BOTTLES IN THE DISTILLERY SO COME ON BY! A premium sipping Rum like no other! Traditionally, Rum is made from sugarcane byproduct, usually molasses. Never one for tradition, Wawyard's Drunken Hive is crafted from molasses made from caramelized BC honey instead! The result is amazing. Dark Fruit and Pecan on the nose with a rich Caramel Brulee body. All finished with Smoky Honeycomb. Only 711 bottles in this Single Barrel Release, available now while it lasts! Definitely not the coffee liqueur of your past. Depth Charge is a beautifully crafted blend of locally roasted coffee and rich dark espresso from Royston Roasting Company paired with organic cocoa nibs and brought together with just a touch of raw BC honey. Historically, a Depth Charge is an explosive dropped overboard into the water in an attempt to damage a submarine. Today, a Depth Charge more commonly refers to a delicious coffee drink made by dropping multiple shots of espresso into coffee, perfect for those early mornings or late nights. Served at 33% with only a fraction of the sweetness of traditional liqueurs, Depth Charge is a rich and sophisticated alternative to overly sweet and syrupy coffee liqueurs. Wayward Krupnik is a big, exciting spirit made by steeping honey with aromatic warming spices, citrus zest, and organic vanilla beans. This aromatic honey syrup is then delicately blended with our hand-crafted honey spirit to create a superbly rich and soul-warming liqueur. Krupnik is an amazing substitute for spiced rum or cinnamon whisky and pairs exceptionally well with beach fires, chairlifts and your favourite flask. Wayward's second release of Bourbon Aged Gin is a celebration of all things barrel! With all the taste of Gin but the maturity of Bourbon. Finely crafted Unruly Gin spends 6 full months in the sweet and smoky heart of a premium full sized Basil Hayden bourbon barrel! Creamy vanilla and citrus on the nose, lively forest notes on the tongue, and a long Madagascar pepper finish will leave you incredibly sad there's only 1 barrel. This is one to sit and savour. Although superb on its own, our Bourbon Barreled Gin adds depth to traditional gin cocktails that dark spirit drinkers often find missing. Amazing in a Negroni or Last Word, it also brings pleasant spicy notes to an Old Fashioned. Only 570 bottles in this Single Barrel Release.